Anything that causes data collection to begin is known as a trigger. It may be as simple as pressing a button in software. Hardware equipment may also generate a trigger signal, which needs to be fed directly into the data acquisition interface. This is called an External Trigger. The Windmill Logger program has several triggering options. Log only when new data is available from your instrument: when a weight changes on a balance for instance. Even if two items weigh the same, Windmill knows that a change has occurred and doesn't miss a reading. Use Excel or other programs to tell Logger to start collecting data. More sophisticated triggering is available with the Windmill Test Sequence program. It can trigger data acquisition according to the time of day, or, if one or more alarms conditions have been true for a set period of time. External triggers let you synchronise data acquisition with external events. This has several benefits. You reduce the amount of data collected. Some instruments, spectrometers for example, have their own timing control and can use triggers to tell the acquisition interface to start collecting data. Acquisition can automatically start when, for instance, you switch on a machine to be monitored. You need only to collect data under specific conditions. For example, you might wish to record what happens to a test rig when an input signal goes outside pre-defined limits. What do the External Trigger Specifications Mean? Product literature from data acquisition hardware manufacturers will tell you whether their equipment will accept external triggers, and what form these triggers should take. The system may be triggered when the external signal passes from a low to a high state: positive edge triggering. Alternatively, it might wait for the signal to change from a high to a low state: negative edge triggering. A trigger can be an analogue or a digital signal. A digital trigger input may be listed as TTL or CMOS compatible. TTL (transistor-transistor logic) is the most commonly used. When the trigger input signal is between 0 and 0.8 V it is considered low, when between 2.0 and 5.5 V high. Analogue triggers let you use, for example, changes in temperature or strain to initiate sampling. 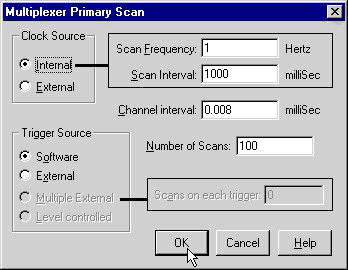 You can program the hardware to be triggered (or to cause a trigger) when an analogue input crosses your chosen threshold. With a flexible system you might set the trigger level as a percentage of the analogue input voltage. If the range was 0-10 V, setting 50 percent would cause a trigger when the signal crossed the 5 V threshold. This is useful when you can choose the hardware range. You can not only start sampling with an external trigger, you can also stop it. When the trigger input leaves the "stop" state, sampling begins. It continues until the trigger signal returns to the stop state. With digital triggers a low signal might be the stop state and a high signal the start state. For analogue triggers the hardware would need two trigger inputs. One trigger might occur when a high limit is passed with a positive slope (low to high) and one when a low limit is passed with a negative slope (high to low). This lets you record, for example, what happens to a test-rig when an input signal transgresses pre-defined limits. This is the minimum time that the change in trigger signal must be sustained before sampling starts, or stop. Typically this might be 1 millisecond. Some hardware lets you specify a pause between receiving the trigger and sampling starting. This is useful if the software needs to prepare itself to receive data. The delay might be around 20 millisecond. Some hardware can collect data before the trigger arrives. You specify how much of this should be retained. This way you can record events leading up to the trigger. For direct hardware triggering the Microlink 770 transient capture unit accepts and can initiate external triggers. For more details of these and other hardware options see https://windmillsoft.com/daqshop/ or contact [email protected].